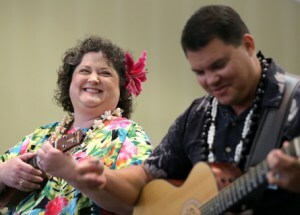 First Choice Physical Therapy’s own Dr. Wade Rinehart joined Melissa Gray to perform a well known Hawiian song, “Ke Aloha” Thursday, April 16 2013, during a celebration of Asian Pacific Islander Heritage Month. Cmdr. Gregory K. Brotherton, executive officer at Naval Support Warfare Center Panama City Division (NSWC PCD), said the celebration of cultures helps open up dialog and understanding. Read the whole article at the News Herald web site.